Like any mail client, you would have the option to organise your folders depending on the type of messages you receive to facilitate easy access to any information you may deem important. However the rate of incoming messages could mean your mailbox quickly gets overwhelmed, making finding vital information from the stack of emails a daunting task. By the end of this article, you will know how to use the Instant Search feature to find any messages, based on who sent it or a phrase contained in the body of the message. You will also be able to perform advanced searches using several parameters and also narrow down your search. Want to see more than 30 search results displayed by default? This article explains how you can remove this limitation to show over 250 search results. 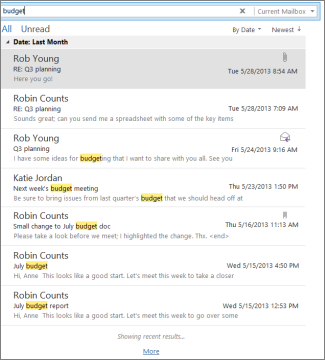 Working in a busy office environment allows you to appreciate the importance of MS Outlook because not only does it organise your emails with ease, the application doubles as your virtual personal assistant calendars to plan your appointments which are all synced to your mobile devices once connected to the Microsoft Exchange server. The focus of this article will be on MS Outlook 2016, although previous versions function similarly. A full comprehensive tutorial will be available on Codexploitcybersecurity.com in the near future. 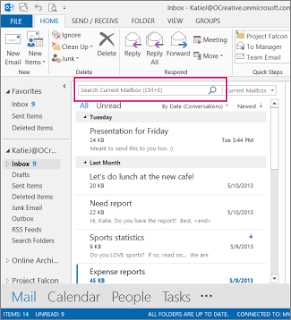 Here is a step-by-step guide on how to perform Instant search using Microsoft Outlook mail client. You may notice the icons are sometimes arranged vertically when the folder pane is minimized. To amend this, just switch the layout of the pane using the Minimize/Expand buttons on the top left of the navigation menu. 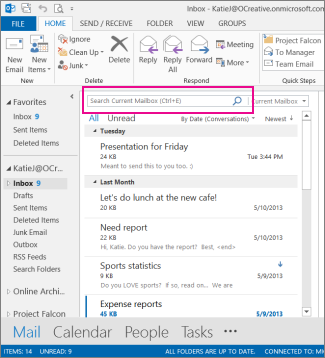 Notice other functionality such as Calendars, People and Tasks can all be accessed on the left navigation pane. 3. Finding a message or word you know is done by simply typing in the search field (e.g. Report and hitting Enter. You can search for a particular person by first, partial or last names and you notice that messages containing your searched term are highlighted in the results. Notice the “More” link at the bottom of search results which can be expanded to see more messages related to your search term. 4. Those of you familiar with Google AdWords paid search functionality, you can use techniques such as phrase match to narrow down your search as follows; using quotation marks to specify you want a phrase match, type in “expense reports” (Use any phrase you want from your email) and notice your results displayed will be emails that exactly contain the phrase in the order specified. Type in expense AND report to return messages containing both words but not necessarily in that order. The operator OR can also be used to refine your searches. Type in expense NOT report to find messages containing the word expense but not the word report. To close and return to your inbox messages, just click x in the search box. Besides Instant Search functionality, Microsoft has built in search tools on the ribbon (The tool bar at the top) which can be used to further fine-tune your searches using a scope. Once you’ve made a decision on the scope you want to use, you can search by using parameters such as ‘Subject line’ or ‘Sender’ Information. Scope: This normally allows you to specify where to perform the search, such as specific folders you’ve created or the main inbox itself - provided you know which folder your message resides. Refine: This usually specifies what to search for and here you can add other criteria to the Refine group. 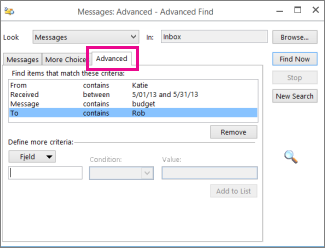 When this option is selected, Outlook executes a special script in the search box to limit the results. Clicking in the search bar opens the Search utility tab loaded with some tools to help specify your search criteria. Let’s take a closer look at some of the options available. · From: Selecting this filters your search results to display messages sent by a specific person. For instance you can search for all messages sent by Julia. 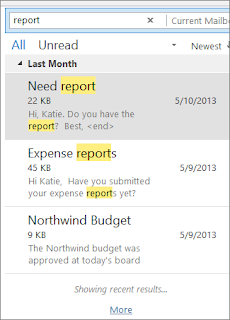 · Subject: You can specify a subject line for Outlook to search through your emails. For example you can search for emails with the keyword ‘report’ in the subject line. · Has Attachment: Sometimes the only thing you can remember about the email you’re trying to retrieve is that it came with a file attachment. 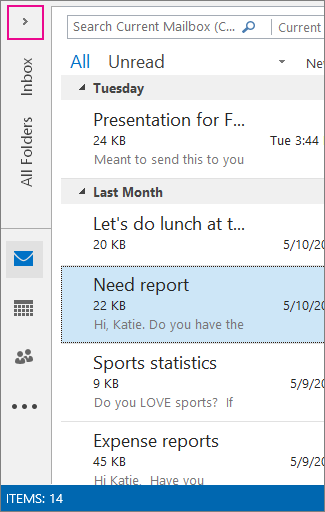 Select this option to display all the emails with attachments. · Categorized: If you flag messages as important or categorize them to review later, this feature can help choose which types of messages to display in the results. · This Week: Perhaps you vaguely remember the week the important message was received; select this option to choose a time frame for Outlook to perform the search. · Sent To: Sometimes an email you are looking for may have been sent to other recipients in your office by CC address. Using this option helps you find emails sent to a specific person. · Unread: This loads up all unread messages in the folder you’ve selected. · Flagged: If you have flagged any messages to review later, selecting this will bring them all up in the results. 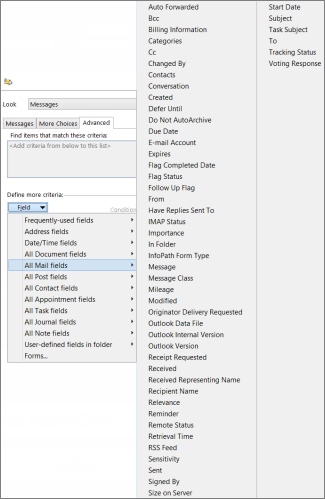 · Important: In Outlook, messages can be flagged as being on high importance, selecting this will display all those messages. · More: This helps with options to further narrow down your search results based on sensitivity and message size. In all cases, you can use multiple criteria to help tailor your search results. Below is an example to search for all messages received last month from John, with the keyword “report” in the subject line? 1. Select Inbox and click in the Search box. 3. Click From and type John to replace the text which has been highlighted. 4. Click Subject and type report to replace the text highlighted in the search box. 5. Click the drop down menu next to ‘This Week’ and select ‘Last Month’. 1. Click the Search box. 2. 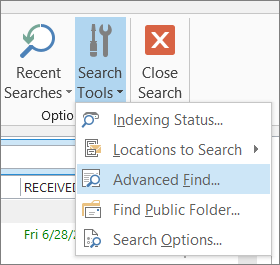 In the search tools menu above, click the drop down button>Advanced Find. The advantage of using this feature is that you can specify much more complex search criteria from your calendar, contacts, notes and tasks to display in your search results. 1. Click the Advanced tab. 2. You will notice a Define more criteria zone, click the Field button and then select All Mail Fields. A new menu of the fields you can search will be displayed including From, To, Received, Subject and tons more. From | Contains | Rhona will search for messages from anyone whose name includes “Rhona”. You will notice in the ‘contains’ menu, you are able to choose is (exactly) which is used for exact match phrases. So if Rhona’s email name is “Rhona Mitra”, From | is (exactly) | Rhona won’t return the desired results because we would need to specify Rhona’s full name, Rhona Mitra, to get an exact phrase match. This is where contains comes in as a very handy condition to use to perform your search. Remember to click Find Now to run the search and display your results. 2 Under Results, clear the Improve search speed by limiting the number of results shown check box. Be aware that the speed of your search will be affected by a large amount of data will have to be crawled to pull out your results. Nevertheless, it is a cool feature if you ever have to deal with finding information from large amounts of emails dating back a few years. This concludes our lesson on how to perform advanced search in Microsoft Outlook 2016 using commands and in built search feature utilities. Hope you enjoyed reading our article and you are welcome to leave us any comments or make suggestions on other ways to perform search in Outlook using our email info@codexploitcybersecurity.com and thank you for investing your time with us. Very helpful article! 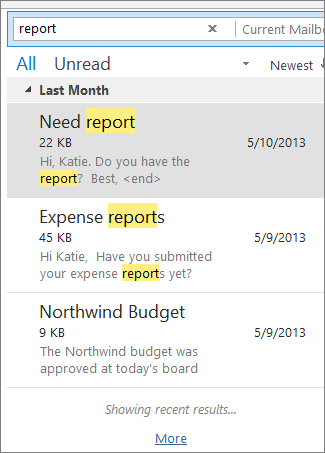 There are a lot of tricks for Outlook searches. 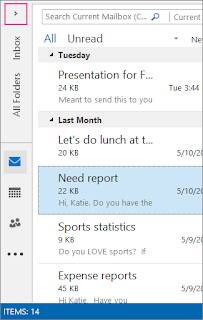 I think these Outlook search shortcuts are also very helpful: https://lookeen.com/blog/how-to-search-faster-in-outlook-with-shortcuts Thanks for the read. As additives to your article, I would like to notice such a moment that I also use some useful tool when I work with Outlook program. This is an online service for https://www.outlooktransfer.com/how-to-transfer-mac-mail-emails-to-outlook/ export mac mail to outlook which helps to safety transfer all files, and if you will need, to convert them. The developers of the program mostly focused on its ease of use and completeness of email conversion, so even if you have never used such software, your experience with gmail to outlook transfer will be thoroughly enjoyable. I think if you will try this, you will understand what I am talking about.